We may be a bit biased, but we think Bordeaux is the best city in the world if you’re looking to combine golf, gastronomy and wine. Over recent years, the city has undergone stunning transformation and there is now so much more to the city than its famous red wine (though that’s still pretty unmissable!) Here are five great reasons (we could probably find 500 more …) to come and share our city with us. The wine trade has long over-shadowed the region’s culinary creativity, but things are finally changing. That’s especially the case with the arrival of Michelin star chefs who are keen to showcase regional produce and make their mark on the French food scene. Bordeaux is now a foodie’s heaven. Pierre Gagnaire (voted the World’s Best Star-Rated Chef 2015) heads La Grande Maison, while Gordon Ramsay has opened Le Pressoir d’Argent in the beautiful Grand Hotel. The showcase restaurant is partnered with Le Bordeaux-Gordon Ramsay, a more relaxed brasserie that offers a unique menu combining great British food with traditional local dishes such as snails, oysters and canelés. We’ve eaten at the new Ramsay offering and it’s exceptional. But that’s not all: Philippe Etchebest, a French chef with two Michelin stars, has also opened Le Quatrième Mur Brasserie in the centre of the city, meaning there is no shortage of world-class cooking now on offer in Bordeaux. 2. The wine – of course! Harvest, or ‘Les Vendanges’, as it’s known in French, is one of the most exciting times to visit Bordeaux. It takes place from mid-September to the end of October, depending on the weather and the vineyard. It’s a joy to watch as the vineyards come to life with the fever, hustle and bustle of hundreds of workers picking the plump grapes by hand. As the harvest comes to an end, the vines prepare for winter, their green leaves transforming into a tapestry of deep reds, purples and, finally, yellows, as they fall away for the year. One of the most exciting things to happen in recent years has been the opening of the Cité du Vin. Part theme park, part museum, part multi-media spectacular, the building is a homage to wine and to viticulture – it’s an international showcase and an open door to the world’s vineyards. 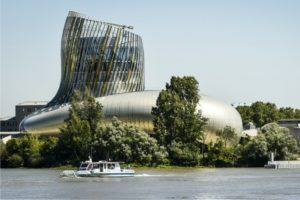 The building itself is on the banks of the Garonne River, its iconic architecture designed to resemble the movement of wine in a glass. 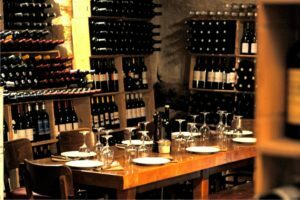 There is no permanent collection, but there’s a self-guided tour of 20 themed spaces that explain all that’s good and great about wine. The final phase leads to the belvédère for a tasting of wines (over 14,000 bottles from 70 countries). And, being French, there’s also a spectacular in-house restaurant. We can arrange a visit for you as part of your golf holiday in Bordeaux. Nowhere is Bordeaux’s renewal more evident than along the banks of the Garonne. What was once abandoned is now open space and gardens; old warehouses on the Quai de Bacalan have become shops, bars and cafés, and the honey coloured stone glows in the reflection of the river. We don’t think there’s a finer city riverscape in Europe. The most spectacular feature of the riverfront is the Place de la Bourse, open to the river but enfolded on three sides by the Palais. 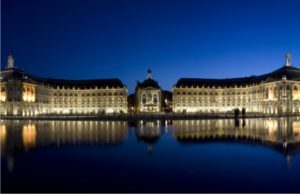 Located between the Garonne and beautiful 18th-century palace façade, is the Miroir d’Eau – a great expanse of shallow water that reflects the palace and comes to life with a magical, misty water display. This spectacular pool is the most photographed site in Bordeaux and is listed as one of UNESCO’s contemporary World Heritage Sites. The effect at night, when floodlit, is mesmerising. The region of Aquitaine is vast and offers a diverse range of scenery, from mountains to beaches. 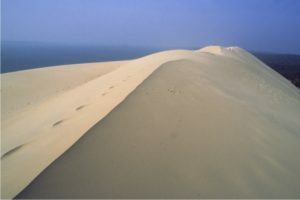 From Bordeaux, the capital of the region, it’s possible to climb the Dune du Pylat (Europe’s largest sand dune), play golf in the Medoc, and lay on the beach at Lacanau – all in one day. Less than an hour south-west of Bordeaux is the stunning bay of Arcachon, one of the largest natural bays in France, and bordered by the Pylat. Voted second most beautiful beach in the world, the bay is famous for its preserved natural beauty, charming villages, oyster farms and eateries. As we’re golf-a-holics here at Greens & Grapes, we feel compelled to mention our favourite local courses. There are around 50 golf courses within striking distance of Bordeaux and we’ve played nearly all of them (so we feel more than qualified to comment). The five-star Grand Saint Emilionnais Golf Club was designed by Tom Doak, one of the best golf architects in the world. It lives up to the billing. Opened in 2015, it’s just an hour from Bordeaux, just outside the World Heritage-listed village of St. Emillion. This stunning course has the potential to be the jewel in the local golfing crown, enhancing the famous vineyards that neighbour it. Golf du Médoc has two major 18-hole courses, Les Chateaux and Les Vignes. The former has hosted many professional tournaments including the French Open. 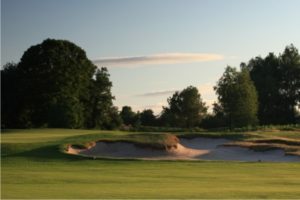 Classed among the top 15 golf courses in continental Europe and third in the Rolex Guide’s French rankings, Golf du Médoc is only 35 minutes from the Bordeaux city center. But that’s just two of our favourite local courses. We can introduce you to these and others when you visit us here in Bordeaux. 3* accommodation with breakfast, 3 greens fees, a three-course meal and 2 wine tastings in a classified wine-producing château. Priced from €750/person, with upgrades to 4 and 5* hotels* (complete with chauffeur) available.